Steamboat Springs has something for everyone no matter what age you are! So if you’re just a year or two short of getting into a bar, here are a few suggestions for anyone under 21. Your trip to Steamboat wouldn’t be complete without a walk through downtown. With so many shops, restaurants, art galleries and activities, it might be difficult to choose where to start, so here’s a few recommendations. If you’re looking for a unique gift to bring back home, then the downtown shops have you covered. A popular place to start is F.M. Light and Sons, you probably saw their yellow signs driving here. 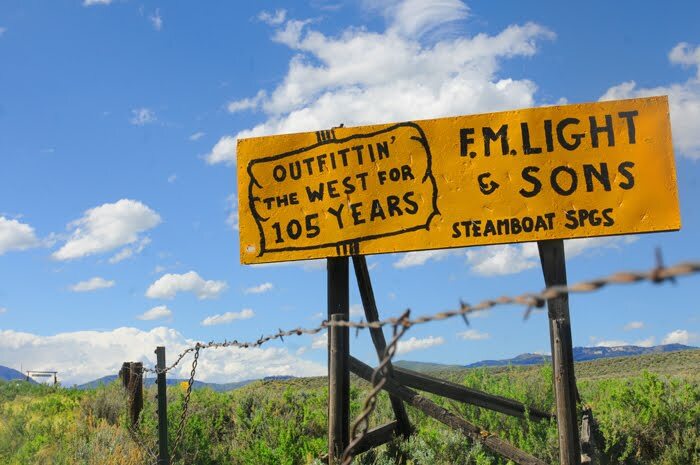 Considering the fact that they’ve been “outfitting the west for a hundred years” F.M. Light is the place to go for getting your cowboy on. If you’re looking for a souvenir that you can only get in Steamboat, then Steamboat Apparel and Gifts is worth checking out. Even if you have no idea what you’re looking for, just take a walk around, you’ll find something guaranteed. A popular destination for Steamboat’s visitors, is the Crooked Key Escape room! It’s essentially a live puzzle that you become a part of. There are three puzzles to choose from: Taphophobia, Escape From the Old West, and Flashover. Taphophobia is a puzzle inspired by the works of Edger Allen Poe, your character is trying to overcome their fear of being buried alive. The Escape From the Old West is a cowboy/outlaw themed puzzle. You play the role of an outlaw charged with murder and you’re locked up in jail. You’re about to be transferred to another prison where you’ll face the gallows. In this puzzle you’ll have to both escape and gather evidence to clear your name. In the Flashover puzzle you play the role of of a Steamboat Springs firefighter. You have one hour to complete your assignment or you’ll fail the mission. Steamboat might not be a particularly large town, but despite its size, Steamboat has eight art museums/galleries all run by local artists. Each one offers a unique and distinct style of art, much of it is “mountain themed” meaning it was inspired by the overall culture of the Rocky Mountains. Other common art genres featured in the galleries/museums are more contemporary and feature modern art masterpieces. A great way to start your Steamboat adventure is a ride up the mountain on the gondola! The ride up provides a scenic view of Steamboat, the Ski Resort and much of Yampa Valley, gondola passes are $49 but are well worth the cost of admission. If you like the view but want something with a little bit more speed, then a zip line tour is definitely worth checking out! The zip line tour consists of six segment course, and usually lasts around two to three hours. If you want the speed but not the heights, then try a ride on a mountain roller coaster! Hiking and Biking: Steamboat Springs has some of the best hiking trails in Colorado, and with the fall foliage at it’s most vibrant, now is the perfect time to lace up your boots or get on your mountain bike. The following were voted six of the best trails in Steamboat! 2.5 mile hike up rugged terrain. With the breathtaking falls and scenic wooded areas, Fish Creek Falls is defiantly worth the $5 parking pass. Sharing the same parking lot as Fish Creek Falls, the Uranium Mine Trail is a relic from the Cold War. It’s a bit more difficult hike than Fish Creek with rocky terrain and a steep incline. The Uranium Main hike offers smaller crowds of people than Fish Creek and amazing views of canyon walls. Located at the bottom of the Steamboat Ski Resort gondola, Thunder Head Trail is a steep 2,200 foot climb, but the view of Yampa Valley is worth the sore feet. If the hike up takes a little too much out of you, try taking the gondola ride down, the ride down is free but you need a ticket to ride up. Located just outside of town, the Hot Springs Trail offers an incredible hike and a perfect way to end a day of walking with a soak in Strawberry Hot Springs – Colorado’s most prized natural hot springs. It’s a 5.7 mile round trip of easy, gently inclining slopes. The cost for a soak in the springs is $15 for adults and $20 on the weekends, so be sure to bring a swimsuit, town and flip flops. If you have a fear of heights, The Devil’s Causeway probably isn’t for you. It’s about an hour and a half drive outside of Steamboat and is around 6 miles of hiking out and back. If you’re up for a challenge, you can hike its ten mile loop. The trail begins on the north side of Stillwater Reservoir on East Fork Trail No. 1119. The first two miles are a gentle slope that curves around Stillwater and Little Causeway Lake offering postcard-worthy views. Then the real challenge begins in the form of a steep, rocky, 1000 foot hike, up to the causeway. If you can’t stomach the fact you’re 11,800 feet above sea level, you should probably turn around here. The causeway itself looks like the Great Wall of China, in some places it’s only three feet across with a 500 foot drop on either side. If you drove in from Denver, you’ve probably seen the iconic rock formation. Located about 20 minutes away from Steamboat, Rabbit Ears Peak is 5.4 miles of hiking through woodlands and rock formations. There are a few “jeep roads,” so if you have a study off road vehicle, you might be able to dive a considerable length of the trail. Another great part of Steamboat is our biking community! With bike lanes on most of the streets, you can peddle almost anywhere you need to go in town. The Yampa Valley Core trail is another part of our Biking culture, offering a seven and a half mile long paved path of smooth and easy riding. Don’t worry if you couldn’t pack your bike, Steamboat has several shops you can rent a all kinds of bikes, including classic crack cruisers, electric bikes, and mountain bikes. If skating is more your thing, the Bear River Skate Park is defiantly for you! In addition to the mile upon miles of hiking trails, Downtown Steamboat has a vibrant culture and new events almost every day. Below are the most recent upcoming events. The Steamboat Wranglers are a minor league hockey club competing in the Western States Hockey League. Join the Great American Laughing Stock Company for a production of Macbeth for the Halloween season. Curtain times are 8:00 p.m. and the shows last about 80 minutes without intermission. This show is rated PG-13 and not recommended for children. HALLOWEEN 5K – October 27 at 9:00am. 5K run/walk on a mix of trail and road that is guaranteed fun for the whole family. Halloween costumes are highly encouraged. Leashed dogs are welcome to join too. Event benefits the Mark McManus Foundation and is directed by The Foundry Treatment Center. There will be homemade after race Halloween treats to enjoy as well as fun for the whole family…bobbing for apples, face painting and games. Race begins and finishes at Soda Creek Elementary School. Grand Adventure Brewing in Kremmling, Co will have a spooktacular party for kids of all ages. There will be a kids costume party from 5 – 7 p.m. and then the adults will get to party from 9 p.m. – 1 a.m. DJ Moco Sound will make this party unforgettable so bring your best costumes. For additional info, please contact Grand Adventure Brewing, 970-724-9219. Since 2002, brothers Paul and Joe DeGeorge (Harry Potter, Year 7 and Year 4 respectively) have released three full-length albums and played over 800 shows all over the world. Their high-energy live show has been legend for since Pitchfork placed the band in their Best Live Shows list noting, “the greatest rock and roll tour of the year took place this past summer in public libraries across America…The Decemberists wish they could lit-rock like this.” They are hailed as the founders of the wizard rock, a sub-genre of music boasting nearly 1,000 bands playing songs about the Harry Potter books. Join Elevation dance instructor Stephanie Rabbitt for this horrifically-thrilling dance class. Stephanie will teach you the moves to Michael Jackson’s Thriller and prepare you for Steamboat’s Hallo-tastic Halloween Stroll (performing in the Stroll is optional, but highly encouraged). This class is open to everyone ages 9 to adults! Dress in your scariest costumes and have a chilling good time. Join Snowbowl Steamboat for this family night of fun. This Halloween party promises fun for all ages, including a costume contest. Prizes will be awarded for the best costume. For additional information, please call 970-879-9840. HALLOWEEN TENNIS SOCIAL – October 28 from 5:00pm to 7:00pm. Located at Steamboat Tennis Center. Come join the Tennis Center dressed in your Halloween costume and play some doubles. Best costume wins a prize. Bring your favorite dish and the Tennis Center will provide the drinks. Ages 8 and up are welcome. Please call the Tennis Center to register, 970-879-8400. HALLOWEEN SPOOKTACULAR – October 31 at 7:00pm. Located at Snow Bowl Steamboat. Join Snowbowl Steamboat for this family night of fun. This Halloween party promises fun for all ages, featuring cosmic bowling and haunted surprises. One of the community’s favorite events is the Downtown Halloween Stroll. For over 30 years kids and families of all ages have gathered on Lincoln Avenue to trick-or-treat and enjoy Halloween festivities. Get dressed in your best Halloween costume and come down to historic Steamboat Springs while businesses open their doors for trick-or-treat fun. Just one of the things that makes the community special. 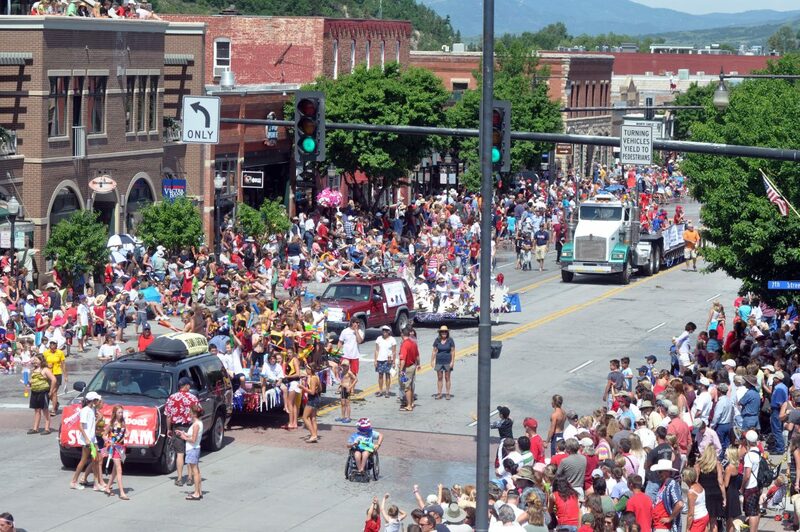 Downtown Steamboat is closed to traffic during the event. Costumes are not required, so if you’re just up for a little people watching check out some of our Lincoln Avenue restaurants where you can pull up a chair and enjoy a drink and an appetizer while taking in the costumes.